Jackson Meyer has thrown himself into his role as an agent for Tempest, the shadowy division of the CIA that handles all time-travel-related threats. Despite his heartbreak at losing the love of his life, Jackson has proved himself to be an excellent agent. However, after an accidental run in with Holly—the girl he altered history to save—Jackson is once again reminded of what he's lost. And when Eyewall, an opposing division of the CIA, emerges, Jackson and his fellow agents not only find themselves under attack, but Jackson begins to discover that the world around him has changed and someone knows about his erased relationship with Holly, putting both their lives at risk all over again. But..but WHY!? What..just happened!? UGH. I did not enjoy this book. I'm not exactly sure if I'm capable of pointing out all of the ways Vortex took a turn for the worse. But I shall try. We left Jackson right after he made one of the hardest decisions of his time-traveling life: he went back in time to a few months before him and Holly ever met. He based his reasoning on love, on wanting to keep Holly safe-it was his most selfless act to date. 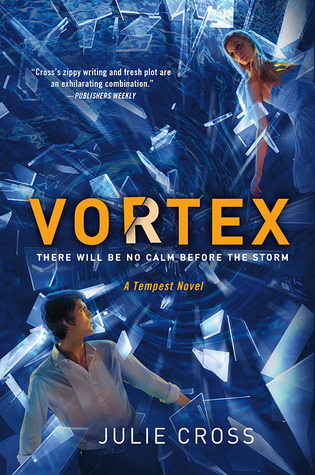 In Vortex, we learn that Jackson has joined forces with his father, and is in training to become a CIA agent. As expected, the training is brutal, and the more he learns about the inner workings of the CIA, the more he learns about the constant threat they face from the EOT's (Enemies of Time- the time traveling "villains"). To carry us nicely to the climax, Jackson bumps into Holly about halfway into the book. To say things get messy from this point forward is an understatement. Sadly, this is also where the book just stopped making any sense to me whatsoever. I'm not sure if the author decided "Ah HECK with it! I WILL confuse them AFTER ALL! Muhahaha! "..because that was the exact state of my brain while reading this book: confused. I completely got, and appreciated, what Julie Cross did with the first book. She took a "complicated" theory of time-travel, and made it decently easy to follow. I feel like with Vortex, she decided that maybe she was way too easy on us the first time around, because the jumble of timelines, mixed with a whole slew of side characters, made my head throb. I couldn't keep track of what, where, when, who..and mostly importantly..WHY!? Okay, it seems unfair to throw "why" in there, because this book IS a 3-part series, and questions can always be answered in the next book. But nevertheless, I just felt like there were so many exaggerated plot twists. It bordered on contrived, I kept hoping it would right itself, and tone down just a bit, but obviously, no such luck had me. Lastly, Jackson and Holly's "relationship"...*le sigh*. So unfortunate. I also kept hoping that I might start rooting for the "connection" they were apparently supposed to have, but UGH, I just wanted it to stop. Alike the first book, there was just ZERO chemistry, I felt NOTHING between them, and everything that Jackson said in regards to his feelings towards her just made me want to punch him in the face. I know, a bit much? Maybe. I wanted him to just give it up already, and fall for one of the female side characters that I actually grew quite fond of. I want to say that I won't be reading the final book in this series, but I'd only be lying to myself, and to you. And I love you guys, so I won't lie: I WILL read the last book. Hopefully there is some massive redeeming in there.